These Flourless Banana Pancakes are so fluffy and delicious they light up even the gloomiest days of all. Banana, Oats and Eggs make the most incredible flourless pancakes on the planet! After the huge success story of my Flourless Peanut Butter Cookies, I went on a mission. Goal: flourless breakfast. Don’t get me wrong. I looove good bread for breakfast. The emphasis lies on “good” though. Good artisan bread takes time to make or is expensive to buy and sometimes there simply isn’t enough time to do it all. Our go-to breakfast is always either overnight oats or Instant Pot Steel Cut Oats. My kids can’t get enough of oatmeal. I get bored pretty easily, however. So here a way to switch up your morning routine: super airy and delicious Flourless Banana Pancakes. 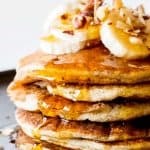 There is tons of recipes for banana and egg only recipes out there for pancakes. They are high protein but have no carbs at all and my kids and I NEED carbs for breakfast. If I don’t feed the breed carbs in the morning I have whining kiddos by 9:30 am because they’re already hungry again. As if they weren’t always “hungry again” enough all day. So, MY Flourless Banana Pancakes are wheat-flour-less but not carb-less. I use oats to fill up the tummy while still keeping them protein rich with 4 eggs. Naturally sweetened with banana and the maple syrup is obviously optional. The bigger the kids the more they’ll want it. I’m the biggest kid of all I’m afraid. Ha! 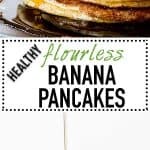 Are flourless banana pancakes gluten-free? Oats themselves are naturally gluten-free, not all packaged oats are completely gluten-free though. Sometimes they are cross-contaminated when harvested or packaged. 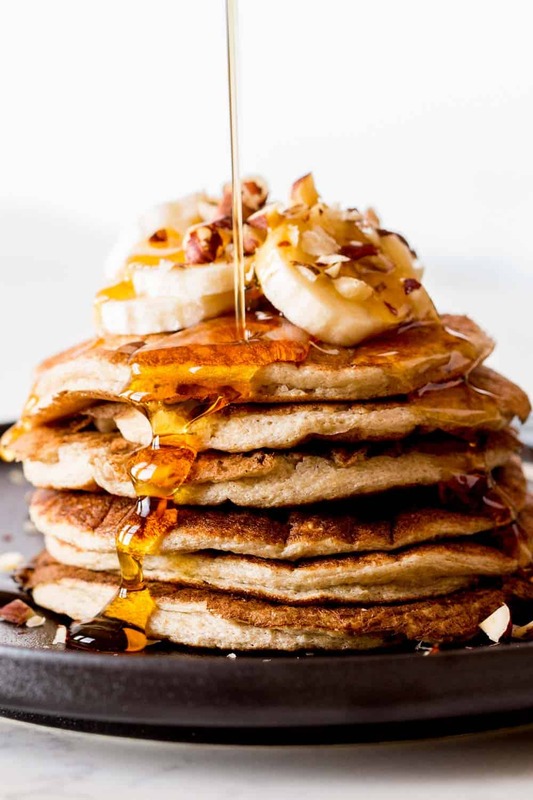 To make absolutely sure there is no gluten in your oats by certified gluten-free oats for your Flourless Banana Pancakes. All other ingredients in this recipe are gluten-free. If you’ve ever made pancakes for more people than just yourself you know it takes an eternity in just one pan. If you love pancakes and make them often I recommend using 2-4 pans at the same time on different burners. OR invest in a cool thingy like a Plug-In Electric Griddle where you can cook pretty much all your pancakes on the plate at the same time. Preheat a non stick pan over medium low heat. Separate egg yolks and whites and beat whites until stiff. Set aside. (Make sure there is NO egg yolk in the whites and the bowl and utensils are completely oil-free or they won't become stiff). Add banana, oats, egg yolks, vanilla and almond milk to a high performance blender (a regular blender might need some scraping a couple times) and blend until completely battery and pourable. Add batter to egg whites and carefully and slowly mix together. Don't mix too vigorously because the egg whites' air bubbles will disappear and the pancakes come out all deflated and flat and not at all fluffy. Add about 1/4 cup batter to the center of your HOT pan. You can oil your pan a tiny little bit if you desire, it's not really necessary though if the pan is REALLY hot. Cook for about 2 minutes on one side and 1-2 minutes on the other or until golden brown. Add sliced banana and chopped hazelnut on top and serve with gallons of real maple syrup. This makes enough for a few days for me. Can you freeze and re-heat on the stove or griddle? Love this recipe, I only cook for myself, so halve the ingredients and find it makes me enough for two days. They are so easy to make, so light and amazingly tasty. Thank you so much! I was really looking forward to making these pancakes…unfortunately they failed. I’m not sure what happened. I had stiff egg whites, I didn’t overmix the batter and I used a hot pan. They were mostly raw inside. What went wrong?? I’d love to try them again. Hi Deb, I’m so sorry they didn’t turn out for you. I’m not exactly sure what could have gone wrong. Was your pan too hot maybe? If it’s too hot the pancakes start burning from the outside while not cooking from the inside. My stove goes from lo-1-2-3-4-5-6-hi and for pancakes I use 2. It takes a little longer per pancake but that way they don’t burn and cook through. I really hope you give them another go. Happen the same to me. Raw, very very soft, they all broke. 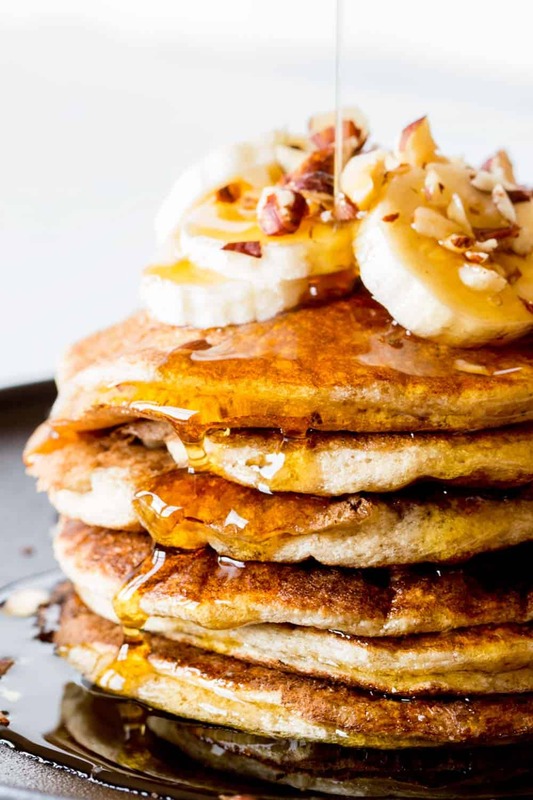 I LOVE banana pancakes, so I can’t wait to try your recipe! 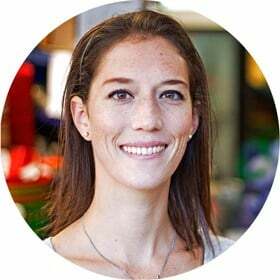 Will 1 cup oat flour work? I’m lazy and don’t want to grind my oats. Looks like a great recipe though! I’m lazy and don’t want to grind my oats. Can I just sub in 1 cup oat flour? Looks great! Ha, ha! I love the 500 gallons of maple syrup!